In 1992 Italy was convulsed by two brazen Mafia assassinations of high-ranking officials. 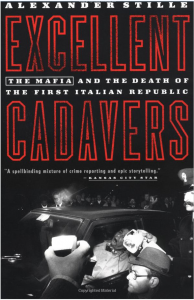 The latest “excellent cadavers” were Giovanni Falcone and Paolo Borsellino, the Sicilian magistrates who had been the Cosa Nostra’s most implacable enemies. Yet in the aftermath of the murders, hundreds of “men of honor” were arrested and the government that had protected them for nearly half a century was at last driven from office. This is the story that Stille tells with such insight and immediacy in Excellent Cadavers. Combining a profound understanding of his doomed heroes with and unprecedented look into the Mafia’s stringent codes and murderous rivalries, he gives us a book that has the power of a great work of history and the suspense of a true thriller.